This product has been discontinued, it has been replaced with the DJI E305 420 Lite ESC this page is for refrence only. The DJI Wookong 30 Amp OPTO ESC is used on both the Flame Wheel Multi Rotor HexaCopter F550 and the QuadCopter F450 with these DJI 920Kv Flame wheel Motors. 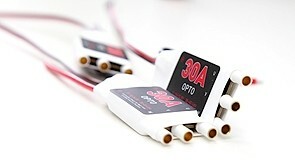 The 30 Amp OPTO ESC is designed to work with the DJI Innovtions 920Kv motors running the 10" or 8" propellers, these ESC's have no internal BEC as it's not needed when they are used with the DJI NAZA or the DJI WKM Flight Controllers as both of these flight controllers come with a BEC (known as a PMU) included in the kit. If you need to order a PMU thay can be ordered on the DJI NAZA LED PMU BEC page.